Once upon a time, in the southern Indian state of Kerala, lived an avadhoota. As with all avadhootas, he was also dis interested in his bodily well-being and it gave him the status of a “mad man” in a society which believes in accumulation of wealth, corresponding social status and physical well-being. To mock the superficial society, and to teach them the futility of the repeated terrestrial existence, every day, this avadhoota used to push a big round stone up the hill and with great effort, before sunset, he would bring the stone to the top of the hill. Then, he would push the stone downhill and laugh at it rolling down. This action gave him the title “MAD”. While people were in a hurry to categorize him as a “Mad Man”, they did not understand the method in his “madness”. He was teaching the ignorant society a precious lesson about life. The stone represented human life. People work hard from birth till death to accumulate wealth and “secure” their life; and death takes it all away. At death, everyone leaves empty handed. All that they accumulate from birth till death, including wealth, status, rewards, qualification, emotions and relationships, gets annihilated and left behind. Nobody carries anything when they depart. The stone was a symbolic representation of life itself. The grave effort of building it up is lost in a second, when death happens. Everything gets undone, with physical death. The avadhoota spent his whole life doing the same thing and giving the same message to people. Unfortunately, as always, people only saw the obvious – the action, and not the precious message within. The avadhoota had no house of his own and he lived in the village burial ground. Dogs and foxes appeared every night to devour unburnt flesh from dead bodies. They never bothered him. Like aghoris, he cooked his meal in the funeral fire or with the fire from the funeral (in India, dead bodies are customarily burnt, not buried). And after eating, he would sleep on the burial ground. He also did not have any work that earned him his daily bread, and yet, by “working hard” everyday by pushing the stone up the neighboring hill and then dropping it, he demonstrated the need to be active, for a larger purpose. He found his food through begging. If nobody gave him anything, without complaints, he would sleep with an empty stomach. Having food or lack of it never bothered him. A true renunciate indeed!!! The story goes like this. 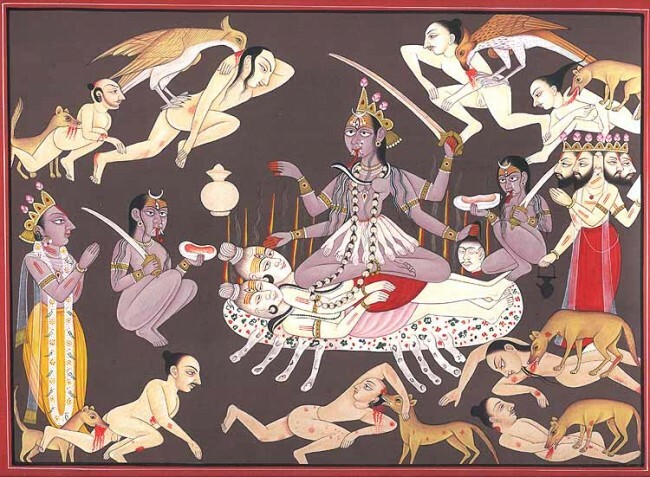 Goddess Kali and her entourage (which consists of fearsome Demons, Ghosts and Vampires) used to visit this burial ground on specific nights, such as Fridays or Tuesdays, to dance in the funeral fire along with the souls of the departed. This dance also signifies victory of death over life, i.e. the temporariness of human existence. So, when Kali and her dancing troop came to the burial ground, they saw a “human” sleeping there. Goddess cannot dance in front of humans. Human beings are of gross and inferior existence, according to them. 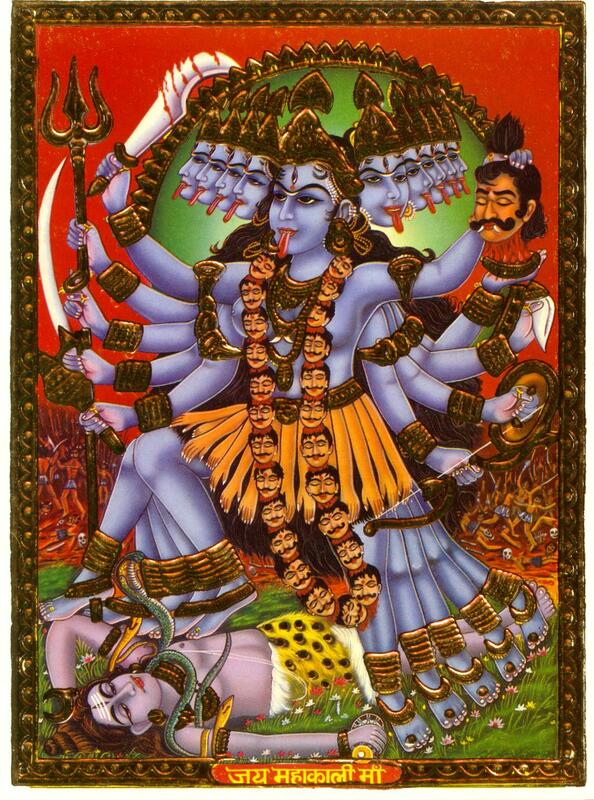 And, till then, no human being has survived seeing such fearsome spirits and Kali. People who have seen them have died out of fear. So, they decided to frighten the sleeping avadhoota. They made all sorts of sounds to wake him up. He did not even open his eyes. He was not enjoying the normal sleep, he was in samadhi state. Finally, he opened his eyes and got up. He sat there, watching the efforts of Kali and her team of ghosts, trying to put fear into him and drive him away. He watched their show like a movie and sometimes clapped his hands. Kali and her team got tired of this. Finally, Kali came to him and said. “Oh Man, I am pleased with you. No ordinary human can see us, witness our dance, and still be sane. You are no ordinary human. I am pleased with you. I want to give you a boon.” The avadhoota smiled and said “Thank You for your kindness. You and your team really entertained me. I am really happy. I do not need another boon. I am fine. If you are finished with your dance, please leave the place and let me sleep a bit more, before the day break. I have heavy work to do when the sun rises.” (Pushing the stone uphill and watching it roll down at sunset). But the mighty Kali insisted: “I have decided to give you this boon. You should tell me what you wish for.” After a lot of persuasion, he asked Kali: ” When will I die?” Kali gave him the exact date, place and time of his death. He said: “I want to live one more year.” Kali explained: “When a human takes birth, his longevity of life is pre-determined. He comes with the full karmic agenda. Nobody can tamper with it, including me. So, I cannot give you this boon.” He laughed, then thought for a while and said “OK. Then subtract a year from my life – give me one year less.” Kali said “I cannot tamper with your karmic life. Nobody can. Your destiny is well defined. Everything happens accordingly. The time, space, and the faculties are chosen and the experience is inevitable. You cannot cut it short and leave early. You have to move with time and complete everything that you came here for, before you exit.” The Avadhoota laughed aloud and teased Kali: “This means you do not have much power as you pretend to have. I do not need anything else. You may go.” Kali explained “Even the God Almighty does not interfere with the karmic agenda, created by existence. Existence creates karma, using the faculties. Unit souls that represent existence, aid it. So, units creates karma individually and collectively as they come together. The unit experiences singularly and collectively. Karma gets lead by itself. Bodies and minds happen based on Karma. The underlying factor is karma. Nobody interferes with Karma. 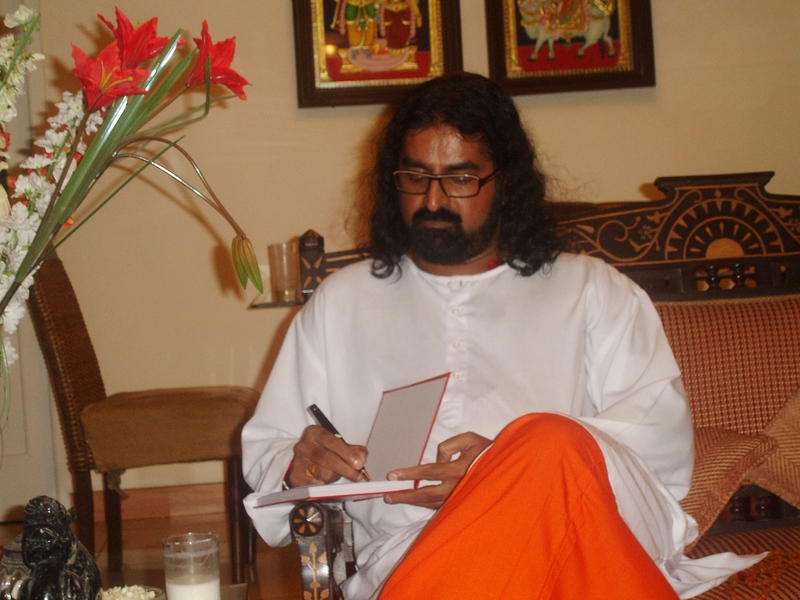 It is the Dharma of Gods to allow Karma to happen…. I cannot leave without giving you a boon because I have offered you one. I am Goddess Kali and I have to keep my word.” Again the Avadhoota teased Kali: “Can’t you give me just one day of life more?” She said “NO”. “One day less”. Again she said “NO”. He laughed at her helplessness. The avadhoota humbled the Goddess. Finally,out of sympathy and not out of requirement, he pointed to his swollen left leg. He was suffering from a disease called “Elephantiasis”. His left leg was swollen and heavy. He told Kali “Did you see my left leg, swollen and heavy?” She said “Yes”. “OK, Shift it to my right leg and relieve my left leg. It has taken pain for long. Now, let the other share it.” Kali shifted his disease to his right leg, blessed him and disappeared with her entourage. Remember, he did not ask Kali to remove his disease. He was not resisting anything that life gave him. He was just ridiculing the pomposity and resistance attached to our everyday existence. We become proud and egoistic with the feeling that we are doing everything and it is us, who move the world. The world is moving. Our powers are quite limited. Moreover, the avadhoota himself had the power to change anything, including his disease, if he wanted to. But, a real Siddha will never use any of His siddhis for self satisfaction or selfish needs. He uses it only for dire necessities and sometimes as an eye opener, to install or re-install faith in people. The detached life of an avadhoota is a true message to man-kind that is running after fleeting glories and paltry pleasures. Burial Ground is a great place of complete justice. The rich and poor, the prince and pauper, all are alike in the burial ground. 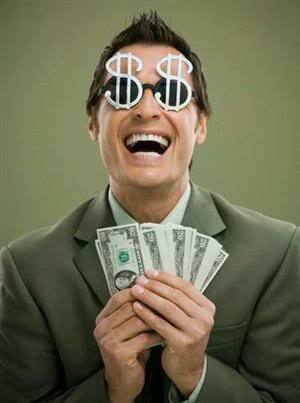 The eventual residue of the very rich and very poor is the same – a handful of ash!!! We apply ash on our forehead, as a reminder to others that eventually, we will become nothing but ASH. This is meant to annihilate our ego, by reminding us of the eternal truth of perishability and unity. Fire does not discriminate. It burns everything alike and still does not get contaminated. It stays clean. Water purifies, but gets contaminated. Air purifies and takes on the negativity. Earth also purifies, but gets contaminated. Fire purifies, burns everything into ashes, but, stays pure always. Who Will Share My Karma??? Karan was born poor. His parents were poor. They lived in a small town in the suburbs of the city. They could not provide him good education or even food and clothes. As soon as he completed his 12th class, his paternal uncle took him to the city. He stayed with his benevolent uncle, found a job and started earning even while he was a teenager. He was good at work and was quite loyal. He even skipped his lunch and worked to complete his tasks. His employer liked him, a silent performer, and thus he grew in his career, quite rapidly. A few years later, when he became well established in his work and was earning a good salary, his parents found him a native girl, and got him married. He was very happy with his marriage. His wife was a quiet and loving woman, who took care of his household chores without any complaints. They were a good match. Everyone loved them. Years went by and they were blessed with three children, two boys and a girl. Meanwhile, he got an opportunity to go abroad and get into a job, which paid him many times more salary than his current job. He and his family settled down and again, he grew in his career, as well financially, rapidly. He became very rich. Meanwhile his father expired. He looked after his mother well. He invested in land, buildings and owned many establishments along with his best friends as partners and became one of the richest men in his home town. A smooth life of glory. He was happy and people were happy with him. When he was 55 years old, he decided to return back and enjoy the fruits of his toil. He came back and started living in his home town. He had left his home town many years ago and he felt a bit alienated. But, money attracted people to him. He made many friends. Slowly, sycophants started spoiling his mind. He started getting into arguments with his partners and slowly took over most of the companies to himself. He used various methods to achieve this end. He became a completely different man. The peer pressures of his home town made him a ruthless businessman. He took over all the distributed shares, by force, through threats or, in some occasions, by paying off. Thus, he strengthened his position in the town. He stood for the local elections and also gained political clout. He became invincible. Along with politics, he entered into many corruption practices, bribery and “handling” of people who opposed them. Thus, a once clean employee became a totally corrupt and dictatorial employer. People feared him, more than respected him. It was a path of “no return”. He kept walking unconsciously and in a way, helplessly. One day, while he was leaving his office, late at night, he was beaten up by some people. He did have his driver and body guards. It was like an ambush, just outside his office, which was totally unexpected. They stabbed him in his stomach, broke his collar bone and ran away. He was immediately hospitalized. He had lost a lot of blood and was in intensive care for almost a week. Slowly he recovered and his state frightened and shocked his family and friends. One thing was clear – some people were affected by him so much that they want him dead. There was a big threat to his life. When he was out of the hospital, when he could travel on his own, his brother-in-law took him to an old saint. His aim was to calm his agitated and shaken up mind. The saint looked at him and said: “You came empty handed. You will leave empty handed. What have you conquered?” Karan said: “I was a poor man. I became rich with my own hard work. Everything is hard-earned. I had to secure what I earned for my family and children.” The saint smiled. “Did the place, time and environment happen to you, or you created it?” Karan said “It happened to me. I used it.” Saint replied: “Good. Good understanding. What about your corresponding actions, which harmed many?” Karan said“I had to do whatever I did. The message had to be delivered loud and clear.” Saint: “What about the affected?” Karan was silent. There was no answer. The saint said: “They also decided to give their message loud and clear. That is what you are suffering from now.” The saint then said: “One more question. You are responsible for all your actions, even if the guidance was from others. Right?” Karan said “Yes”. Saint: “Just tell me, who will share your fruits of action, you may call it SINS?” Karan was shaken again. “Do you think your wife or children will share any of your sins? If you are doing everything for them, they should also share your sins, right? Will they?” Karan started crying. The saint consoled him: “Remember my son, Mind means dissatisfaction. Wisdom gives satisfaction. Depend on your wisdom. Mind means Greed. It always remains dissatisfied. It wants more. It wants more money, more power, more positions, status, food, wine, women, control….so on and so forth. If you get carried away, you will hurt others and you will harm yourself. Nobody can suffer your fruits of action on your behalf, except in a larger collective way. So, please share with others and sharing will bring you happiness. Hoarding will give you more anxiety. Go home in deep peace.” The Saint blessed him. He came home and contemplated on the words of the Saint. He realized that nobody can share his burden and nobody will. He has to run his own life. He was born alone and will die alone. All that he accumulated cannot be taken with him. He cried for a long time. He distributed a lot of his wealth to poor people of his town. He started free schools for the education of poor children. Irrespective of caste and creed, he provided meals to anyone who came to his estate, any time of the day. He relieved himself from politics, distributed his business to his children, and plunged himself into charity. Life gives rude shocks to make us understand certain inevitable truths. Those who understand will evolve. Those who resist, will perish further. This is the nature of life. Enlightening tales and lessons. At your divine feet Mohanji, with more thanks. A wonderful message with simple stories. Really a good moral to every one. Amazing Read! Thanks Mohan ji! Moving stories, “THANK YOU” Mohanji for these poignant reminders, overlooked ever so often as we move through the rigors of our routine life…loved the messages therein…so much to learn from and so much to evolve in life..have a long long way to go…I feel that my journey in that direction began on that “Blissful Day” when I had the good fortune of meeting up with Yourself and Babu…it changed my perspective in life..however I have yet to begin I think..its going to be a long and tedious journey for me for sure but am ever so grateful to you for letting me in to your world of love, kindness and understanding….with fond remembrances, thanking you once again and my humble Pranaams to you Mohanji! What a deep & defining message that was , left me absolutely speechless . Thank you for your gentle divine guidance.All of are blessed to read your words here. I can say nothing more,but thank you from the core of my heart & soul. The story of the avadhoota turned into a poem. I am sharing it with you. Thank you for so much inspiration. What did he want with the stone? Longevity of life is pre-determined. Goddes Kali and Siddha/Avadhoota must have known between the two themselves, but the actplay is for our understanding, Presume so?